08/04/18 Mirror photo by Patrick Waksmunski / Penn State wide receiver Juwan Johnson and defensive tackle Kevin Givens goof off during media day. UNIVERSITY PARK — Penn State has had a number of outstanding defensive tackles in recent years, and Kevin Givens has a chance to be the next star at the position this season. The Altoona Area High School product isn’t just excited about that possibility, he’s driven by a strong desire to carry on the tradition. Givens already is a household name among Nittany Lion fans because he’s gotten so much playing time the past two years. He’s appeared in all 27 games, making 10 starts, and has been a big part of the defense as both a tackle and defensive end. But after spending most of last year as a backup tackle behind seniors Parker Cothren and Curtis Cothran, Givens enters this season as the most experienced and most talented tackle on the roster, and he will be a starter from the get-go. “I’m real confident about Kevin,” defensive end Shareef Miller said. “He’s one of the best defensive linemen on our team because he’s versatile, can play D-end, defensive tackle. He’s been doing a great job for us. Coach James Franklin has pointed out numerous times that defensive tackle is one of the Lions’ biggest question marks entering the season. He’s not really talking about Givens — although there are some areas the junior will have to improve — but rather that there’s just not a lot of depth at the tackle spot. “I guess he’s just talking about the young guys coming in, see how well they develop,” Givens said. It’s no secret that Penn State likes to rotate defensive linemen throughout each game. That’s something a few teams in college football like to do, but it’s a luxury that most programs just don’t have, so they end up playing their starters most or all of the game. Givens, who’s 6-foot-1 and 285 pounds, has been an effective player the past two seasons playing around 30 snaps per game. His career high was 51 last year at Michigan State, and if the depth behind him doesn’t develop as the coaches hope, he could be out there for 45-50 snaps or more most games. The great defensive tackles that have come through Penn State in recent years — Jared Odrick, Anthony Zettel, Devon Still to name a few — had tremendous “motors,” meaning they went 100 percent on every play and didn’t wear down. But the more plays a linemen is out there, it’s natural that fatigue could set in. Givens had 23 tackles last season (9 solo), plus 3 ¢ sacks, four tackles for loss, a forced fumble, a fumble recovery and two pass breakups. During his redshirt freshman year in 2016, he had 26 tackles (12 solo), 4 ¢ sacks, seven tackles for loss, two fumble recoveries and one pass breakup. Expectations are much bigger for Givens this season, so he will be counted on to blow by all of those numbers. He also still could play some defensive end, as he did a season ago, depending on certain matchups each game. “Kevin Givens is a grown man,” Franklin said. “He’s really grown and evolved in so many different ways in our program. 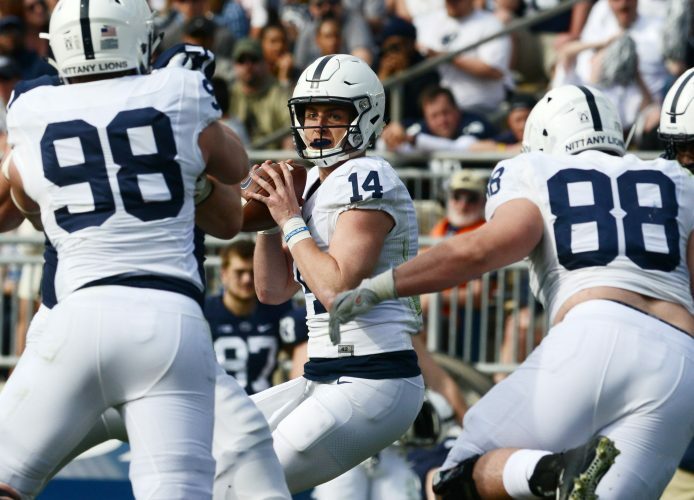 The reality is that Givens will need to have a significant year for the defensive line if it is going to be able to slow down opposing offenses enough for Penn State to win 10 games or more. If he doesn’t, the concerns about the defensive line and front seven as a whole will only get louder and louder. Givens came to Penn State as a talented but raw player, and he’s already made huge strides on and off the field to become the player he is today. But he also has a chance to get much better the next two seasons, which then would give him a great chance of playing in the NFL. And what is the Penn State way, in his mind? “Non-flashy, hard-nosed, clean way to play football,” Givens said.